When it comes to cheese, we do our best to stay sharp and on the cutting edge (Ha! Did you see what we did there?!). The cheesy humor aside, it’s an exciting time in our industry, with trends emerging within our market that we wanted to share with our customers. First, America’s cheese consumption is at an all-time high – up 42 percent over the past 25 years, according to USDA figures – and opportunities for continued growth in the category appear strong. Not only are you craving more cheese, you’re also continuing to evolve the ways in which you’re purchasing and enjoying it. The growth of online shopping, snacking, bold flavors, pairings, convenience foods and an ongoing desire by customers to choose natural, artisan foods, are all impacting how we’re making cheese. We love Snacking. Snacking now represents 50% of all eating occasions. Cheese is well aligned with the trend and enjoys a unique position as both a healthful and indulgent snack. In 2015, consumers will snack on cheese in all forms – from cheese curds, string cheese and cube nibbles to elegant cheese picks and meal-replacing cheese boards. With Hard Cider. Hard cider with cheese is the next big thing in food and beverage pairings. Dry ciders pair well with rich, buttery cheeses like cheddar, aged gouda and blue, while semi-sweet ciders are perfect with mild, nutty, soft-ripened cheeses such as brie and camembert. In Sweets. As an addition to traditional sweets, cheese satisfies sweet-salty cravings and lets chefs give unique twists to classic flavors. This year, we’ll see more sweet-savory cookies made with cheddar, blue and other cheeses, and more pancakes with cheese used as fillings and ingredients. We had to explore this trend further and are currently testing some interesting dessert recipes; keep your eye on our website and Facebook page where we’ll be sharing our favorites! With a Kick. Consumers’ constant search for unique, bold and global flavors will continue into 2015. 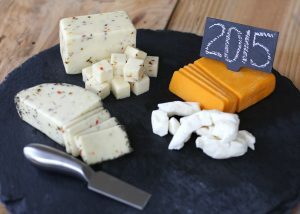 Millennials, in particular, will seek out cheeses with hints of jalapeño, herbs, smoke, garlic and basil, as well as bitter flavors such as espresso. This explains why at the food shows we’ve attended so far this year, our Blaser’s Ghost Habanero Pepper Jack cheese has been a hit! In Convenient Forms. Slices, shreds, spreads and snack sticks made up a large share of convenient cheese products launched over the past year and they’ll continue to grow in 2015. We think of our cheese curds as the first snack-friendly cheese (they’ve always been bite-size), so we were excited to hear that according to the Wisconsin Milk Marketing Board’s data, cheese curds will lead the list of convenient cheese forms. With a Smartphone. More than two-thirds of Americans use smartphones and more than 80 percent of Millennials rely on their mobile devices when shopping, according to Nielsen data. They’re choosing, planning, sharing and buying food online, and that includes cheese. Mobile websites and apps help shoppers pair cheeses with their favorite beer, wine or spirit. One of our favorite apps is Wisconsin Cheese Cupid. Get your version and give it a try the next time you visit one of our retail stores!